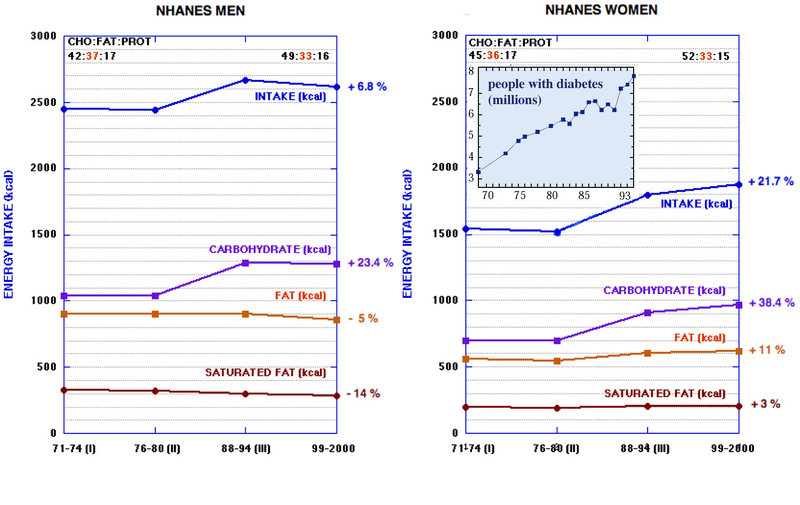 Below is the NHANES data for men and women, altered a bit from the source to take out the distracting diabetes data. The TWICHOOB's like to trot this graphic out to illustrate how carbs are the cause of the obesity epidemic. However, this data pretty much counters just about every argument put forth by low carb advocates. In the interests of time, I've altered just the data for men to what it should look like to support TWICHOO. And I don't want to hear it from any of you that I'm misrepresenting it, because "it" has constantly changing goal posts and the current dig-in-the-heels version is that Americans actually went low fat, replacing large amounts of fat with carbohydrate, spiking insulin and causing fat to accumulate willy nilly and obesity has nothing to do with overeating in any way, shape or form. So, this at right is what the data should show. A reduction of fat as a percent of calories in the diet from 37 to 29% (a "low fat" diet), and a concomitant increase in carbohydrate consumption from 42 to 53% (please forgive the math quibble here, I'm just too lazy to fix it, you get the idea I hope). Back to the actual NHANES data, however. 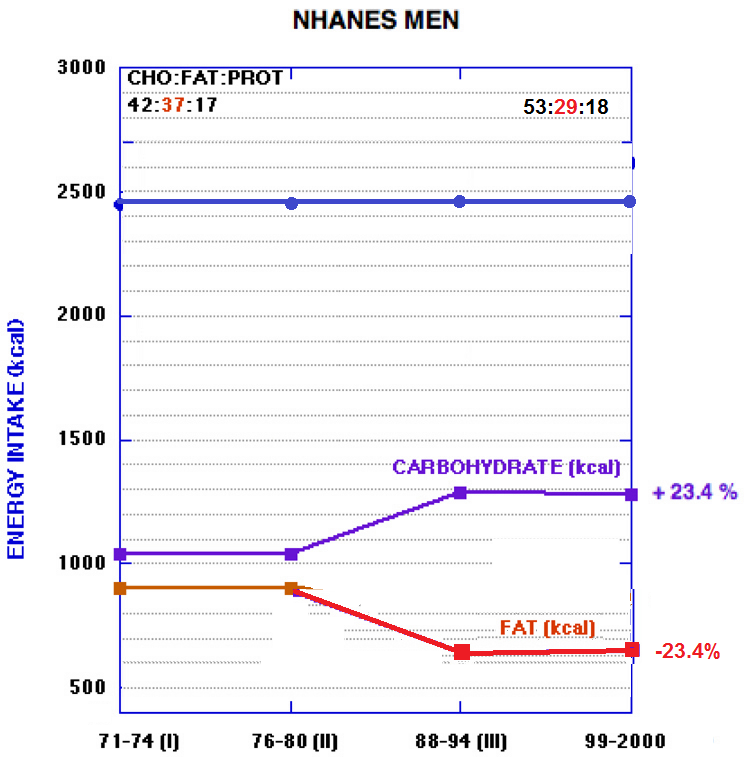 Even looking at this data, we have the men reducing fat % from 37 to 33% while carbs rose from 42 to 49% of intake. And the women? Fat went from 38% to 33% while carbs rose from 45% to 52%. Given all the studies done where the LC diets were "hardly low carb" according to the militant keto wing of the movement, can we at least have a wee bit of intellectual honesty here and admit that the differences in macro proportions is largely insignificant? No, the myopic view of the data is that carbohydrates are responsible for the increased intake and decreasing fat has made us more fat. Let's look at this a little more critically, shall we? 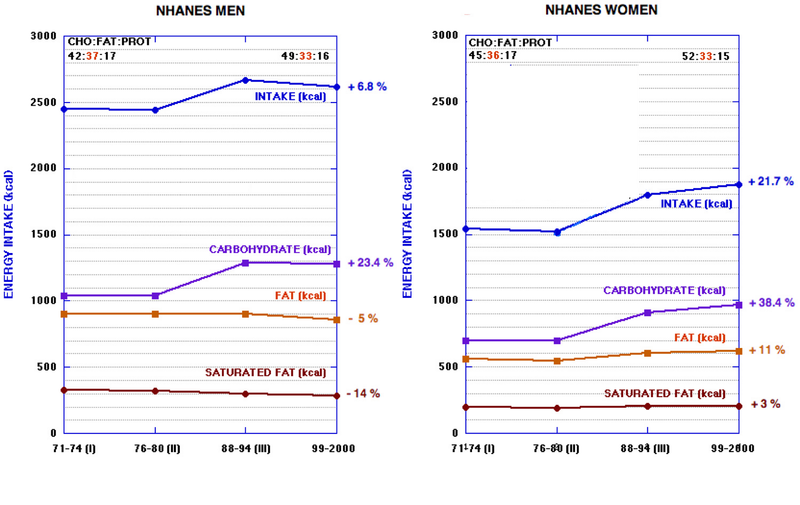 The men did actually decrease fat intake by <50 cal/day, but the women appear to have increased absolute fat consumption by about 50 cal/day. 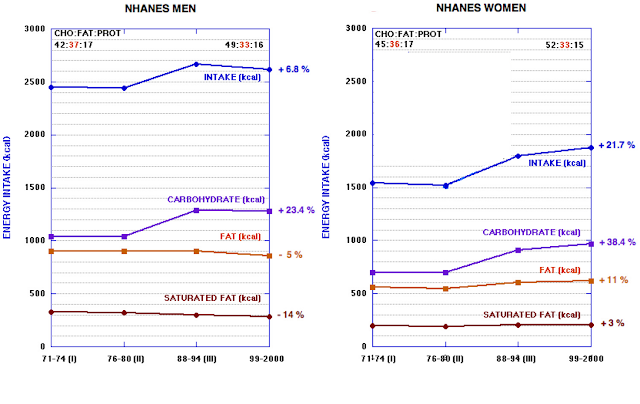 If we figure there are roughly equal numbers of males and females, this averages out to ... no change in fat intake! Americans did not heed the low fat advice! Something's fishy with NHANES gender split? I think so. Just look at a certain Swedish diet doctor's peeve, low fat and no fat yogurt. I know I'm always seeing commercials featuring linebackers and male doctors, lawyers and Indian chiefs (that's a saying from my childhood, however un-PC these days) hawking low fat yogurt. I also know far more women "diet" at any given time so would likely be consuming low fat products. And yet somehow the men managed to reduce intake ever so slightly while the women managed to eat a tad more fat over the years? The American diet that did not promote excessive obesity was not a "high fat" diet at >35% fat. The American diet that did not promote excessive obesity was not a "low carb" diet. In 1970 it was M/F: 42 / 45 % carb , 1050 / 600 cals carb , > 250 / 150 grams carb. A ha! That's the problem! It just took a while for the 151st gram carb and up to cause insidious weight gain!! 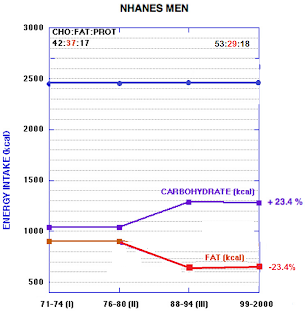 If NHANES is to be believed, it does not support any contentions that fat intake was reduced and replaced with carbohydrate. The obesity epidemic correlates with .... eating more! Obesity is more prevalent in women than men. Women increased their intake more than men. The latest entry into the make-a-buck-on-LC sweepstakes, Jonathan Bailor, needs to go back to the decade's worth of research he OBVIOUSLY IGNORED and revise his unequivocal "cause" being that we've exceeded some imaginary threshold of 43% starch & sugar consumption. Really, it's embarrassing!! When one plays with percents, they can convince some people of anything. As I've been saying since before I've been blogging ... there's NO need for an "Alternate Hypothesis"! During my visits to Russia, I have a chance to witness recent changes in how population eats and the beginning of the obesity epidemic. The biggest marker of changes - the appearance of fat children. As I said in my comment in a previous blog post, there is much more in a diet than just a percentage of nutrients.Russians always ate a carb-heawy diet, but no one worried about fat content, absolute majority of people cook from a scratch even now. There are several changes, the biggest one is the propaganda of necessity of "healthy" snacks and drinks and the raising popularity of its consumption. Drinks are either juice or yogurt - based and contain sugar or juice, nothing is sweetened with HFCS. Just noticed this time around something that supports the FRH (if we are going to grandiosely infer things from correlational studies with all of 4 timepoints): CHO consumption and intake move in parallel. Since the diets through this period were neither LC nor LF, it's plausible that the availability of more/newer carbs--didn't HFCS come into heavy use after the 70's?--with enough fat to make it palatable, resulted in greater overall consumption. Not that this observation should be taken, as some are wont to do, as suggesting some sort of tension between (the efficacy of) LC and FRH. 'In the interests of time, I've altered just the data for men to what it should look like....' For a second, I thought you were gonna pull a Hyperlipid! can you do a cliff notes version of why you are against LC diets? i need a broad, simplified overview before a get into the details. i'm really trying to understand this. i lost a big abdomen cooking from scratch and avoiding eating lots of high carb stuff. no one here is "against LC diets". 1 the science used to push them - much of it's bogus. 1a contra evidence and better theories are being ignored or "straw-manned"
> 1 the science used to push them - much of it's bogus. Or it's good research that's mis-reported or mis-interpreted or the results are unreasonably extrapolated. "1a contra evidence and better theories"
i would really appreciate it if you could give me a brief outline of what you mean. down the right hand side in the "topics" box. Below the topics box is the flowers background. That's a STARTING point. James Krieger, Anthony Colpo, Stephan Guyenet, Paul Jaminet are further points to explore. Lyle McDonald wrote a book on ketogenic diets but his critiques of the current fads is not in one place. I've responded at length, in detail to this type of query on many forums before because Lyle McDonald did the same for me. I don't anymore. I've come to appreciate Lyle on this point. I think it's pretty much a no-brainer that we don't need modern industrial foods to get fat. But this is where food reward does still come into play as many traditional foods -- potato & cheese stuffed vereneky (perogies) fried in butter and onions served with sour cream anyone? I dunno, my generation was raised by parents who grew up during the Depression where we trick or treated for UNICEF and were admonished not to take our food for granted because there were starving children in Ethiopia. Combined with other lifestyle changes, it's a bit of a perfect storm for the advent of "Big Gulps", Value Meals, free refills, etc. etc. Subsidies have wreaked havoc on the economies of various foods and made processed foods relatively cheap. Add the engineered palatability in with those foods ... and we're sunk. As you said in another comment -- it's actually quite the miracle we're not all obese! Hi v/v: I think (long time reader and commenter here) Sanjeev has answered this pretty well. I think LC has many great uses -- I still eat lower carb myself, though I'm considering an epic biohack where I eat vegetarian (or maybe pescatarian) for a few weeks! I think using garbage "science" to promote LC, and to portray it as some magic cure for obesity is ... frankly ... dishonest. Please search on "11 critical", "toothpick" and "myth of starving cells". I think the three posts are a good summary of what's wrong with low carb "science". HFCS no doubt contributed to this b/c combined with subsidies and tariffs it made it very cheap. And what soda drinker isn't going to get the larger size for pennies more when given the opportunity? Our national love affair with liquid calories is a HUGE part of this. Whether it be pure sugar SSB's or your Starbucks or your smoothies and whatever. It's all something that just wasn't part of the culture when I was a kid and it did start to take off during my teen years and just kept on going. We didn't need to keep some Ethiopian children in mind in order not to waste our food in Russia because grown-up people spent a lot of time getting food - I remember very well long lines first to counter with meat or milk products or vegetable department in a store in order to choose the cut and for a store clerk to weight and wrap it up and then another line to a cash register to pay for your purchases, then to collect your meat, bag of veggies, chunk of cheese from different departments in exchange for recites. Often you had to walk from store to store in order to locate the one which sells meat, for example, or butter.A lot of food were not prepackaged, for example, in order to buy a sour-cream or a sunflower oil, we often had to bring out container into the store to be filled, even beer was sold into individual containers, not always, but often. However, fish was sold almost everywhere and was ridiculously cheep. Now all stores in Russia are organized like here in US, but it changed only 20 years ago. Most people didn't have cars and some had no elevator at home, so all goods were carried in hands. It provided additional incentives not to buy prepared drinks or juices often. After doing all that, there is a fat chance many people would comfortably put any food in a garbage. On the top of it, most of our pay-checks was spent on groceries. I still don't waste my food. My son ,who is naturally lean, had a wonderful satiety regulation, no matter what kind of food, how much he likes it, or how much is left, when he is full, he would not touch a crumb. I use leftovers later when prepare another dish, like leftovers of broccoli go to some omelet, leftover of mushed potatoes of meat got frozen and added to some cooked soup later, things like that. Cabbage stew is a convenient recipe for using some cold cuts and meat leftovers. In Moscow we had relatively good assortment of available food during Soviet times, but behind borders of Moscow or St.Petersburg, even within 50 miles from Moscow, most people had to grow their potatoes, rabbits, they kept goats and chicken in order to provide families with food. Many mostly ate potatoes with sunflower oil and salted pork belly, sauerkraut, cabbage soup and bread daily, a lot of tea, often with food preserves, gruel for breakfast. No LC diet was possible for most of population, but fat children surfaced only now, despite all potatoes, bread, vareniky with cheese or meat and sour cream population ate before. BTW, ice-cream in Russia is outstanding and very cheep and widely available, and always has been, it is actually a frozen custard. As you can see, for the population growing fat I mostly blame wrong food schedules, snacks and sweet drinks. Only that, basically ,changed besides from food shortages, and there are fat children now. I dismissed food deficits, because we had from time to time quite bare store shelves, but stocked pantries at home. Excellent points, Evelyn. Love how you end it. Ha! "Razwell virus" I had to turn my comments off while I deleted all of his posts. Hey David! Welcome to the Asylum!! Yeah, well wear it as a badge of honor of sorts :D You've "arrived" if ol' Razz ma Tazz spams your comments! @Galina "..the population growing fat I mostly blame wrong food schedules" - well that does jibe with the Salk Institute study involving the two groups of mice that ate the same # of calories, it's just one group was on a strict schedule & limited feeding window while the other group could eat whenever they felt like & did so all day long & ended up obese. Just because of their feeding schedule.